Upgrade of Veeam Backup Enterprise Manager to version 9.5 Update 4 is supported for version 9.0 Update 2 (build 9.0.0.1715) and later. To upgrade from earlier versions, contact Veeam Technical Support. With Veeam Backup Enterprise Manager and managed Veeam backup servers connected to it, remember to begin the backup infrastructure upgrade process with Veeam Backup Enterprise Manager. Veeam backup servers should be upgraded after that. If you have Veeam backup server installed on the same machine, upgrade it immediately after completing upgrade of the Veeam Backup Enterprise Manager server. It is recommended to disable local antivirus and antimalware software to prevent it from interfering with Veeam Backup Enterprise Manager setup. You can enable it after the upgrade procedure is completed. For more information, see https://www.veeam.com/kb1992. Ensure there is no active processes, such as any running jobs and restore sessions. We recommend that you do not stop running jobs and let them complete successfully instead. Disable any periodic and backup copy jobs, so that they do not start during upgrade. Perform a backup of the corresponding SQL Server configuration databases used by Veeam backup server(s) and Veeam Backup Enterprise Manager server, so that you can easily go back to previous version in case of issues with upgrade. Note that built-in configuration backup functionality does not protect Veeam Backup Enterprise Manager configuration. Download the latest version of Veeam Backup & Replication ISO from: https://www.veeam.com/downloads.html. Click Upgrade Veeam Backup Enterprise Manager. Follow the setup wizard steps. At the SQL Server Instance step, select the SQL server, instance and database that was used by the previous version of Veeam Backup Enterprise Manager. If you have Veeam Backup & Replication installed on the same machine, upgrade it immediately after completing the upgrade of the Veeam Backup Enterprise Manager server, otherwise this local backup server will not be able to run jobs. Proceed with upgrade of your Veeam backup servers. After you upgrade Veeam Backup & Replication servers to version 9.5, Veeam Backup Enterprise Manager starts maintenance jobs to optimize the state of its database. The initial maintenance jobs session may take significant amount of time (up to an hour, depending on the database size). After the job finishes, the database will be brought to an optimal state, and subsequent maintenance job sessions will take much less time. 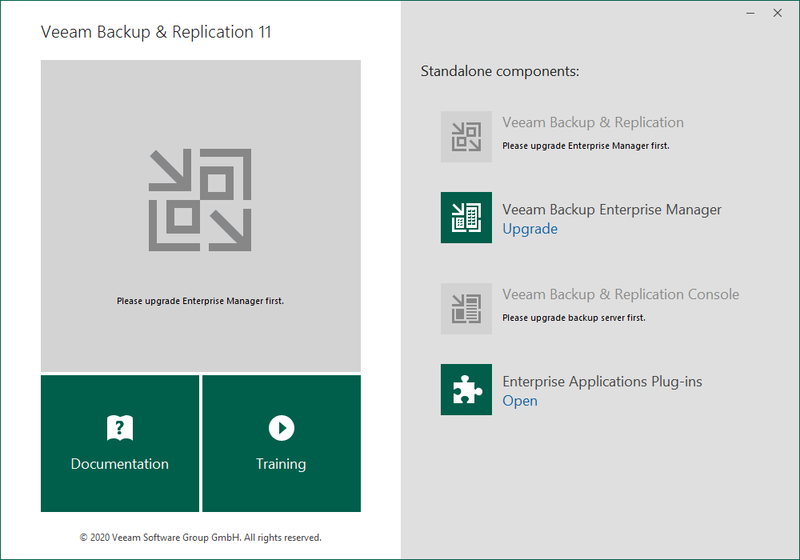 New features of Veeam Backup Enterprise Manager version 9.5 Update 4 will be available after all managed Veeam backup servers are upgraded, and initial collection of data from these servers in Veeam Backup Enterprise Manager completes successfully. Download and install the latest available update (if any) from https://www.veeam.com/updates.html.